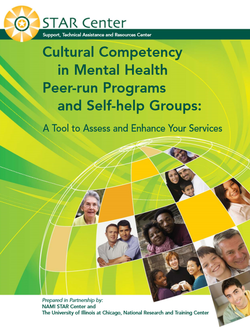 Cultural Competency Guidebook helps both peer and traditional mental health programs to assess their cultural competency in five organizational areas. It also guides users in creating specific action plans to better serve people from diverse cultures. It’s not unusual for mental health programs, both traditional and peer-run, to feel that they already do a good job of serving people from all walks of life. Additionally, there's a widespread belief that sharing the experience of mental health recovery puts individuals on equal footing with each other despite any cultural differences. Certainly there is common ground and mutual understanding among people who have experienced mental health problems. Nonetheless, we all have more to learn about cultures and lifestyles that differ from our own. This manual is for leadership and staff of community-based mental health programs. It has been used by peer-run and self-help programs, psychiatric rehabilitation programs, community mental health centers, drop-in centers, and community clinics. Users have found the manual to be both practical and encouraging, thereby enabling them to set organizational goals that could be achieved within a reasonable timeframe. There’s a common misunderstanding that being culturally sensitive means treating everyone “the same.” In fact, this is only part of what’s needed. Cultural competency also involves embracing and acting on different cultural viewpoints, rather than setting them aside in order to treat everyone equally. The manual helps programs identify the ways in which their activities are already responsive to culturally diverse individuals, and areas where they need improvement. It also guides users in creating specific action plans to enhance cultural competency in five organizational areas. The manual also includes strategies and tips successfully used by mental health programs to enhance cultural competency. It is 36 pages long, including worksheets for organizational ratings and action plans. It can be downloaded for free, and printed and bound for use. A computer and printer are required to download and print the workbook. Internet access is needed for one of the exercises involving obtaining census information about the cultural makeup of the program's or group's surrounding neighborhoods. It is recommended that a Diversity Committee be formed and resourced, in order to make and execute the diversity action plans. 1. Read the whole manual before conducting assessments and making action plans. 2. Consider forming a Diversity Committee charged and resourced to conduct the assessment and move the organization forward with its diversity goals. 3. Become familiar with the common challenges organizations face when introducing change, and be ready to address them so they don’t derail progress. We have outlined a number of these challenges at the end of the manual. 4. Before setting any goals, conduct a Diversity Survey of your membership and staff. You need to hear from the people you serve and employ about how you’re doing in terms of diversity before making plans to address limitations and build on successes. We provide a sample survey in the manual.